CNN: Can Kenya avoid Africa’s resource curse? Kenya has struck oil in its remote northwestern Turkana region after exploratory drilling by Anglo-Irish firm Tullow Oil, but has yet to establish commercial viability. 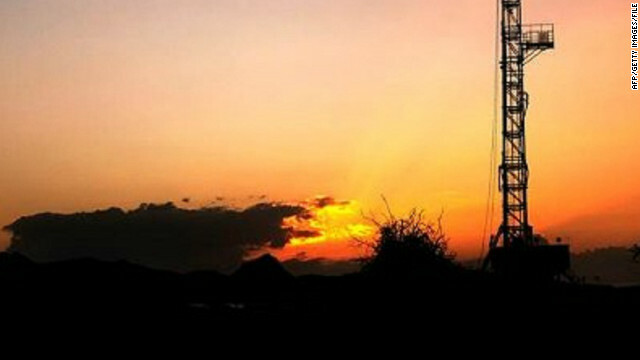 (CNN) — Not long ago, attending international oil and gas conferences, East Africa was the graveyard session. All the smart money was on the Gulf of Guinea and I and a few other analysts would sit through almost empty sessions more out of courtesy than curiosity. No longer, East Africa is the new oil and gas frontier, and the meetings are packed. Three statements released in March by international oil and gas companies prospecting in Eastern Africa demonstrate this – a fourth impressive gas find in Tanzania by BG Group and London-listed Ophir Energy saw their shares soar. Italian energy company ENI also announced new gas reserves in Mozambique, and Anglo-Irish Tullow Oil, announced an oil discovery in Kenya, that “is beyond our expectations and bodes well for the material programme ahead of us.” How times have changed. Kenya’s President Mwai Kibaki, couldn’t contain his excitement on 26 March and interrupted a scheduled speech to announce the find by Tullow in the country’s north-western Turkana region. You could feel his relief as he called it a “major breakthrough”. Ever since independence Kenyans officials have been wondering why their geology has been less generous than others, and in recent years the pressure has been on, gold, Tanzanite and now significant gas finds in Tanzania and oil in Uganda. Kenya has a strong agribusiness base, exporting tea, coffee, flowers and vegetables. It also enjoys a major tourism industry and Nairobi is a regional hub, providing financial and other services and is a continent leader on telephone banking. If significant oil reserves are found, this could be transformative for its economy. It will also embolden Kenya, that has ambitions to become a leading regional power, but as a columnist in Kenya’s Business Daily wrote, ‘Kenya’s economic and diplomatic clout had largely suffered from a lack of known natural resources that are of strategic importance to the rest of the world’. Kenya’s politicians will need to keep a close eye on this, as regional co-operation within the East African Community rather than head-on competition makes better economic sense. Kenya has already been positioning itself to develop regional oil facilities for exports of oil from Uganda and South Sudan. Work started in March on building a huge deep-water port in Lamu, to service a pipeline across northern Kenya to connect to the port. The West sees Kenya as a regional anchor state although its reputation as a stable democracy, took a knocking with the surge of violence that followed the presidential elections in 2008. New presidential elections are scheduled late 2012 or 2013, and oil will additionally raise anticipation of the spoils of billions of future oil dollars for the victorious. The stakes in these elections have just risen, and the resilience of Kenya’s institutions to ensure a fair election, but also its politicians to gracefully accept defeat is critical. President Kibaki, himself will not be running and has a golden opportunity to secure his legacy by working tirelessly to ensure credible and peaceful elections take place. If Kenya is to effectively benefit from oil, it needs to learn from the mistakes of others. See also: Ghana’s oil discovery: blessing or curse? The greatest worry about oil finds in Kenya is that oil money might further blight an already corrupted political class that many Kenyans complain about. Kenya has a poor reputation for corruption, especially by its political class. A former anti-corruption tsar, John Gitongo fled the country in 2005, fearing for his life and lived in exile in Britain. He returned to Kenya in 2008 and has set up Kenya Ni Yetu (Kenya is Ours), a campaign aimed at mobilizing ordinary people to speak up against corruption, impunity and injustice. If Kenya is to effectively benefit from oil, and avoid the resource curse that many other oil producers have experienced it needs to learn from the mistakes of others. The lessons are clear, strengthen independent institutions and oversight; publish all the taxes and royalties from oil; do not rush into prestige projects and extravagant consumption and don’t neglect creating meaningful employment for Kenyans. Kenyans need jobs, but the oil industry itself never employs many. The key is to use any oil funds, to build up a competitive economy – Kenya’s luck is that it already has a successful base from which to build from. Posted in Kenya | Comments Off on CNN: Can Kenya avoid Africa’s resource curse? In what appears to be a rule rather than the exception, a woman from Githunguri in Kiambu county is nursing injuries at the Kenyatta National Hospital after she was tortured by her employer as she was working in Lebanon. Veronica Wambui who came back to the country claims that she was repeatedly assaulted by her employer for no reason at all. This just perhaps the latest of such incidents, in a country that has seen a migration of young women every year to the rich countries in the east in search of gainful employment due to rising unemployment levels. NTV’s Sheila Sendeyo has that report. NAIROBI, Kenya, Apr 2 – The United States government has indicated its commitment to grant Kenya the green light to launch direct flights to America possibly in a couple of months, provided the upgrades at the Jomo Kenyatta International Airport (JKIA) are done according to international standards. US Ambassador to Kenya Scott Gration said on Monday that once JKIA is certified as a ‘Category 1′ air field by the International Civil Aviation Organisation and Federal Aviation Administration which is a requirement for all airports handling flights operating in and out of America, then direct services between Kenya and the US can commence. “In terms of terminal completion and other things, it will be at least another 180 days before that happens. Things may slip as they often do but we are pushing to make sure that things happen as soon as possible,” the envoy said. Plans to launch the direct flights have been on the cards since 2007 but have not materialised largely due to security concerns by the US government. In 2009, US homeland security officials declined to give Delta Airlines the approval to operate flights between JKIA and Hartsfield-Jackson Atlanta International Airport, via Dakar, Senegal citing ‘security vulnerabilities’ in Nairobi. The indefinite suspension of the inaugural flight, which had been scheduled for June 3, 2009 nearly caused a diplomatic tiff between the two governments, as Nairobi protested that it had not been informed of the decision to cancel the flights. Negotiations have since resumed although they have been hinged on the capacity and ability of Kenya’s main airport to handle direct flights to and from the US. The government hopes to have this status attained by August this year. If achieved, the service will afford the two countries the opportunity to enhance their commercial ties particularly in the trade and tourism sectors. “We believe that there is a tremendous market in the United States for everything including green beans, flowers and we believe direct flights would help to bring investments to Kenya. We also believe that Kenya is on the cusp of tremendous growth and there are many companies that want to invest here.” he stressed. Some of those companies include American multinational aerospace and General Electric (GE) which has already opened its Africa headquarters in Nairobi. The conglomerate is also extending its operations from energy to aviation with the announcement that it had been picked by national carrier Kenya Airways to supply the engines for nine Boeing 787 Dreamliners that it hopes to take delivery of beginning 2014 at a cost of USD380 million. The 19 GE-nx-1B engines deliver 15 percent fuel efficiency and come with lower maintenance costs. Speaking while signing the deal with GE, KQ Chief Executive Officer Titus Naikuni enthused that they would see a significant reduction in their fuel bill in the next few years that would be reflected into their bottom line and enable them to offer competitive rates. Fuel accounts for about 40 percent of the airline’s direct costs. “The engines are bigger, quieter and more efficient than the Boeing 767 engines; have reduced fuel burn and longer periods on the wing between overhauls. This means the Dreamliner will come with lower maintenance costs and therefore ability to be flying longer,” Naikuni added. The delivery will bring the share of engines supplied by GE to 56 percent in the next five years up from the current 42 percent. The two companies hope to further reinforce their partnership by incorporating skills development on how to operate and maintain the engines. 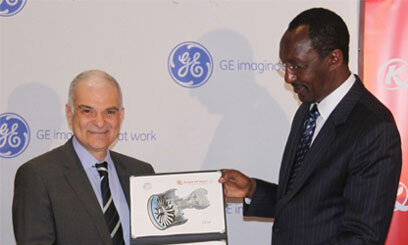 “We will help KQ train its engineers and technicians to be able to work on the maintenance aspects of the engine and also we will cooperate at the higher level with the Pride Center for training of managers and leaders of Kenya Airways,” disclosed General Electric Aviation’s Vice President Sales, Middle East and Africa Isam Moursy. DUBAI: A sales assistant stole a passenger’s diamond-studded watch and a silver chain while at a shop in Dubai International Airport on Oct.2 last year. JW, a 27-year-old Kenyan, on Monday was referred to the Dubai Criminal Court on the theft charges. “Yes I stole the watch and the silver chain,” JW confessed before Judge Hamad Abdul Jawwad. Upon being asked for her request to the court, JW astonished the bench to seek ample time for a lawyer to defend her. Following her confession, the court sentenced her to three months in jail. According to records, at around 6.30am an Indian employee had discovered a small bag left at a table by a passenger. After discovering that it contained a diamond-studded watch and a silver chain, he took the bag and its contents to a Moroccan sales assistant SM, 27. SM had told prosecutors that at around 12.30pm she had left for a nap as JW took charge of the sales. “After two hours I returned to work and sat waiting for an hour as employees from the lost-and-found section were not coming to collect the bag,” SM said. She then decided to examine it again and discovered the valuables had gone missing. SM immediately contacted investigation officers who found the valuables with JW. Six people were killed and three wounded Monday when a gunman opened fire at a small religious college in Oakland. Oakland City Councilman Larry Reid, he represents the area, told The Times he was informed about the casualties by Oakland police officials, who plan a 2 p.m. news conference. A school official said the alleged gunman had been a nursing student at the college. Pastor Jong Kim, who founded Oikos University about 10 years ago, told the Oakland Tribune he was unsure if the alleged shooter had been expelled from the school or dropped out voluntarily. He said he heard about 30 gunshots while remaining in his office for safety. Lucas Garcia, a teacher at the school, told KGO-TV he heard a half-dozen shots in the middle of a lesson before someone yelled that a someone had a gun. Garcia said there are a little more than 100 students enrolled at the university, but not all were on campus at the time. He said the school teaches the Bible, nursing and English. Police arrested the suspect several miles away in Alameda at a shopping center Monday afternoon. According to its website, Oikos University is a Christian university that “was established specifically to serve the community of Northern California in general and San Francisco and Oakland areas in particular.” The school is not far from Oakland International Airport and the Oakland Coliseum. Dramatic live television footage showed officers swarming around the small Christian university, with some appearing to enter the main building. Some civilians were seen being rushed from the building and into police vehicles. 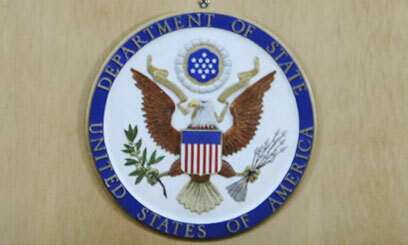 NAIROBI, Kenya, Apr 2 – The US Department of State is set to adjust visa processing fees in 11 days. A statement from the US embassy in Nairobi indicated that fees for most non-immigrant visa applications will increase, while all immigrant visa processing fees will decrease. According to the statement, the department is required to recover, as far as possible, the cost of processing visas through the collection of application fees. “For a number of reasons, the current fees no longer cover the actual cost of processing non-immigrant visas. The non-immigrant visa fee increase will support the addition and expansion of overseas facilities, as well as additional staffing required to meet increased visa demand,” the statement stated. Application fees for tourist, business, student, exchange visitor, and journalist visas will increase from $140 to $160. Fees for work, performance, and religious visas will increase from $150 to $190. Family-based applications, which cost $330 previously, will cost $230. The new fee for the Diversity Visa Program (also known as the Visa Lottery) will be reduced from $440 to $330 per person. 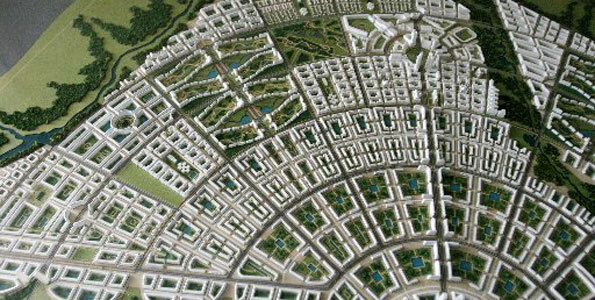 Photo/STEPHEN MUDIARI An impression of the Konza Tochnopolis Park in Malili, Machakos, May 18th, 2011. Phase one of the futuristic park is expected to begin in the near future. A multi-million-shilling land scandal is unfolding in Machakos. At least 4,500 Kenyans have been duped to pay more than Sh50,000, as investors rush to speculate on land near the planned Konza ICT Park at Malili. One of the companies promising to sell land is New Konza Ranch, registered both as a limited liability company and as a society. But investigations by the Nation show that the company is yet to acquire land. It only hopes that the government will allocate it the resource. “We are pursuing an allotment of land from the government in Kapiti Plains,” ranch chairman Muthiani Mwangangi said during a meeting called at the weekend near the district commissioner’s office in Mukaa. As he talked, a lorry full of Administration Police and National Youth Service officers was on stand-by. A retinue of hired bouncers was also at hand to protect the officials from cameras and journalists. The directors of the company were worried. Members had only been informed of the “special” meeting the previous day and most of them had been sidelined. Late last year, an SMS was sent to the 4,500 shareholders requesting them to ‘top-up’ their Sh2,000 with Sh50,000 deposit to a bank account if they wanted to own their allotted land. Those who failed to ‘top-up’ their Sh2,000 were not invited. 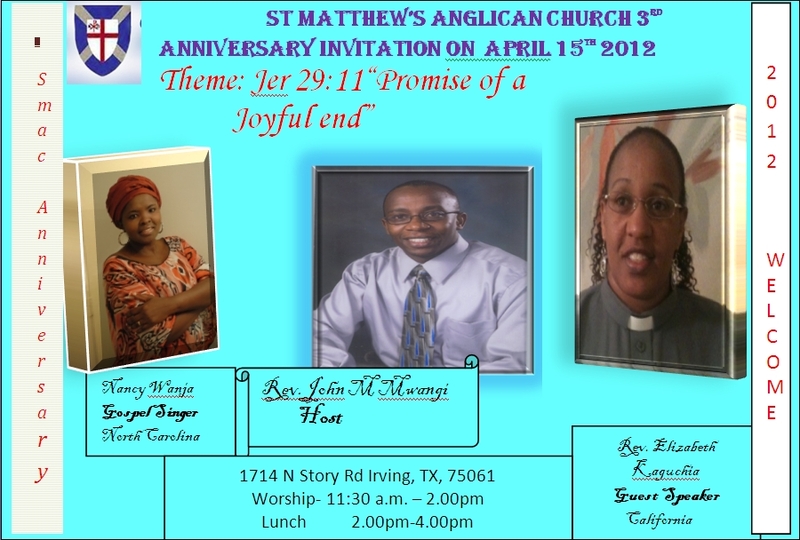 Only about 500 shareholders were invited. “Those are not our members. Our members are only the ones who’ve agreed to what we’re saying and have paid the Sh50,000 per share,” Mr Mwangangi said when asked about the others who had contributed Sh2,000. When the Nation visited the New Konza Ranch offices in Machakos three weeks ago, the Sh2,000 per share and Sh50,000 ‘top-up’ formula still stood. The company was promising an acre for Sh52,000 in an area where an acre can fetch as much as Sh1.5 million. The location of the land remained equally dubious. The company representatives made reference to a faded map of a 3,870-hectare land parcel with no identifiable surveyor’s signature and no land registration numbers. “It’s in Kapiti Plains,” was the explanation. The firm, Mr Mwangangi claimed, had applied for 6,000 acres from the Ministry of Lands in Kapiti Plains. He attributed the delay in the allocation of land to the pending formation of the National Land Commission. Kapiti Plains is a ranch after the Chumvi turn-off to Machakos on Mombasa Road, and before the 5,000-acre fenced-off ICT Park. It is a research facility owned by the International Livestock Research Institute (ILRI). “On three separate incidents, we’ve received reports that there were people trying to sell the land. It’s not for sale and we’ve put up signs along Mombasa Road to that effect,” ILRI’s Board of Trustees secretary Bruce Scott said. An officer from the Machakos Land Registry, who requested anonymity since he is not authorised to speak to press, confirmed that other than the 5,000-acre ICT land, there was no government land in Kapiti Plains. Additionally, if the government had 6,000 acres in Konza, it would not have made sense to buy 5,000 acres to build an ICT Park. When tasked to produce copies of applications made to the Lands ministry for the Kapiti Plains land, Mr Mwangangi was evasive. “We can’t disclose information to anybody, including members. This is our secret,” he said. “We are going to buy the land and our members need to have faith in us,” he added. The legal standing of the New Konza Ranch is equally vague. A search for the entity at the Registrar of Companies uncovered a New Konza Ranch Ltd with Mwangangi as one of the shareholders. C.K. Muthusi and Boniface Sila Mulei were listed as the other shareholders. A similar search at the Societies Registry also unearthed a New Konza Ranch Association. The chairman, this time round, was one Joseph Mutuku. Everline Mbithuka and Muthiani Mwangagi were listed secretary and treasurer, respectively. Ms Mbithuka said the organisation was now strictly operating as an association. The Machakos DC’s office is investigating the New Konza Ranch, a firm that set up shop in Susu Centre in Machakos town in 2010 and has since been peddling murky land deals. “It’s big fraud. I am convinced that there is a group of people who formed a company to defraud others and at the end of the day, they will be very rich,” said Machakos district commissioner Kobia wa Kamau. The highly coveted land along the Mombasa highway seems nothing more than a wasteland broken only by squat mud houses and a blossoming shanty town. However, since the government bought 5,000 acres from the Malili Ranch Company for the construction of Kenya’s first technopolis, land prices have soared. Men have become rich overnight brokering prime real estate and scam artists have found a safe haven. “You have to be very careful about what you buy and who you buy it from. Barely a day goes by without receiving a report about con men,” Malili sub-chief Douglas Mutiso told the Nation. According to the Machakos DC’s office, the New Konza Ranch has been making frantic attempts to acquire alternative land from three other ranching companies that border the ICT Park: Malili, Aimi ma Kilungu and Konza. Calculating how much the New Konza Ranch has managed to collect from people is a tricky affair. Mr Kamau, in a letter summoning the directors to a meeting, estimates that they have amassed Sh260 million. “We have summoned the company to reveal the nature of their activities because we haven’t seen shareholders receive their dues yet,” said Mr Kamau. During Saturday’s meeting it was revealed that the firm had purchased 97 acres. In a sterling performance Allan Kiprono set a new course record this morning, finishing the race in 45:15. 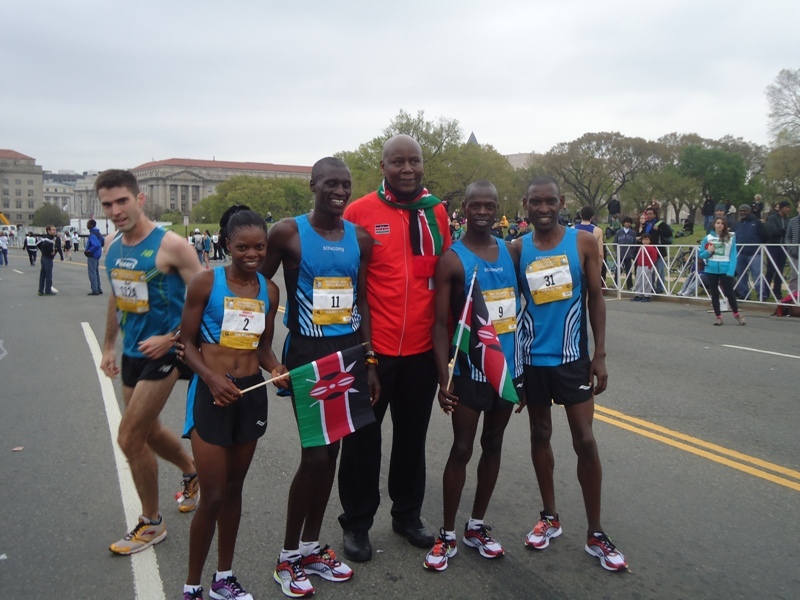 Lani Kiplagat and John Korir came in 2nd and 3rd with times of 46:28 and 47:33 respectively. Julliah Tinega who is defending her title, romped to the finish line in 54:02 leaving her competitors far behind to win the womens event. 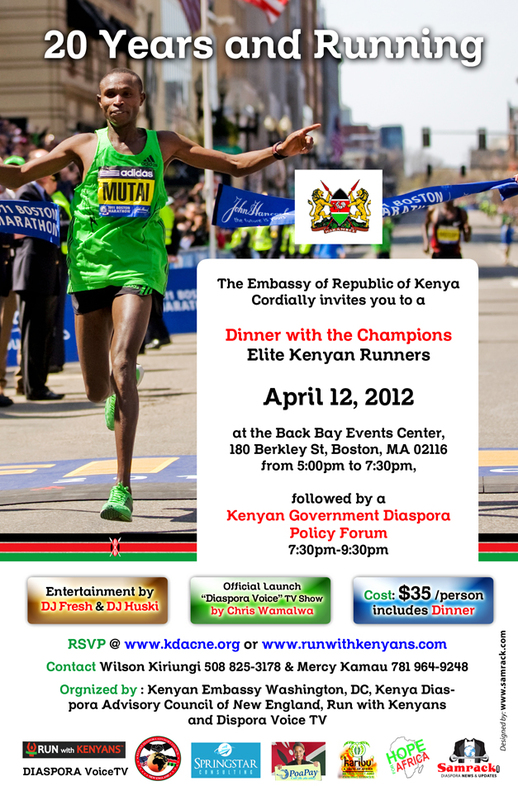 Kenya’s Ambassador to the U.S, Amb. Elkanah Odembo accompanied by members of staff, and friends of Kenya was on hand to cheer and receive the victorious athletes at the finish line amid a sea of Kenyan flags and trademark ululations.